I made vegetable lasagna to bring to my in-law's house yesterday for Christmas. We ended up with extra veggies and decided to use them to make an omelet in the morning for breakfast. 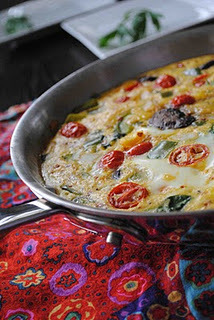 This morning, I thought it would be a good idea to toss it in the oven and make more of a frittata instead. You don't really need a recipe for this, but it was too pretty and colorful to not post, so I'm going to give you my method anyway. You're welcome! In a bowl, whisk together the eggs, milk, black pepper, red pepper flakes, and cheese. In an oven-safe skillet, saute the spinach, onion, red, green, and yellow peppers, and mushrooms with a pinch of salt until the spinach has wilted and the veggies are semi-soft. Pour the egg mixture over the top of the veggies and transfer the skillet to an oven set to 375 degrees. Bake until the eggs have set, about 30 minutes. Slice and serve.